Three years ago, I heard the words Epidermolysis Bullosa. At first, I had no idea what it meant - I thought they were words you’d get in the final round of a spelling bee. But little did I know; those two words would introduce me to a friend who would change my life. When I read an article about Jonathan Pitre in 2014, he was the first person I’d ever come across with EB. I couldn’t believe my eyes when I saw the pictures of Jonathan’s condition and read the struggles he endured throughout his young life. When I met him a couple months later, I was stunned how he made everything I knew about EB go away. He was so upbeat, funny, kind, humble, and, despite his condition, never showed any pain. During that first meeting he did something I’ll never forget: he made a point of shaking everyone’s hand he met. It was his way of paying respect to all people, no matter how painful it would be. Jonathan and I were introduced through TSN, Canada’s leading Sports Network. TSN learned about Jonathan after he met the Ottawa Senators of the National Hockey League, and the network wanted to broadcast a television feature on him. As a feature producer at TSN, it was my job to direct, produce and write the piece. I had worked with high-profile athletes before, but I knew this was going to be an incredibly different experience, especially considering how deep we’d have to dive into Jonathan’s life to convey his story. The first day we went to film with Jonathan and his mom Tina, it just so happened they were doing a bath. For those who don’t know about Jonathan’s routines, he and his mom change all of his bandages every other day in the bath. It’s their way of cleaning Jonathan’s wounds and helps prevent infection from occurring. In the articles I’d researched before the shoot, the bath was described as the most grueling and painful 4-hour process of Jonathan’s day. Needless to say, I was a bit nervous going into it. It was going to be tense, serious, painful, and unlike anything my cameraman and I had experienced before. Within 5 minutes of the bath starting, all my preconceived notions went out the window. Instead, it was filled with stories, talk about each other’s days, and an incredible amount of laughter. I couldn’t believe what I was seeing. My trepidation completely vanished. And soon, my cameraman and I found ourselves engaging in conversation with them, something we’re never supposed to do while filming. But it was impossible not to because they were so welcoming and inviting throughout the bath process – this was their normal. So there we were, four people crammed into a bathroom filled with cameras, tripods and microphones. Jonathan was in the bath, Tina was kneeling down next to the tub, my cameraman was pressed up near the toilet, and I was leaning up against the sink. At one point Jonathan was pulling a bandage from his arm, and a piece of skin pulled off with it, causing an open wound in the area. We actually used the moment in the final piece. Jonathan’s face tenses up, his eyes roll into the back of his head, and he begins fighting the pain he’s feeling. He takes a few breaths, pushes the pain away, recomposes himself, and carries on unwrapping his bandages. A few minutes pass, and he looks over to me and says, “Hey Ross, you’ve been leaning against the sink for a while… do you want us to get you a chair to sit on to be more comfortable?” I couldn’t believe it. The kid who just went through the most painful part of his bath was concerned with my comfort? I was dumbfounded. Over the next few months, my cameraman and I spent countless days and weeks filming moments with Jonathan – going to school, doctors’ appointments, hanging out with his dog, doing interviews, going to sporting events, more baths and dressings, etc. But through all of it, that moment in the bath where he asked me if I was okay never left me. I think it defines everything about the relationship I have with Jonathan and EB: just when you think you know everything about either entity, they will change your mind or perspective completely. I look at life differently than when I first found out what Epidermolysis Bullosa meant, and it’s all thanks to Jonathan. I’ve learned happiness is a mindset, and that a glass half empty is also half full. I’ve learned to roll with the punches and accept things for the way they are, because life will never allow you to do otherwise. I’ve learned what real pain is. I’ve learned to focus in on what’s important, and to treasure it. I’ve learned to question what I really want out of life and define who I want to be, no matter the obstacles. I’ve learned to be brave when the road ahead looks impossible. And I’ve learned all this from a kid. There’s one last thought I’d like to share with anyone who has EB. One of the questions I get a lot from people is what it’s like to see Jonathan’s body during a dressing change. They ask if his wounds are graphic and hard to look at. My answer is simple: it’s just Jonathan. He is the wonderful person who makes me laugh, brings life into any room, makes us think deeply about our existence, and has wounds on his body. He is all of these things. And that’s the biggest takeaway I’d want for all kids with EB – you are everything you are, not one thing. Don’t be afraid to be yourselves and embrace everything about you. It’s difficult to do, but please know there are people out there who will love and accept you just the way you are. 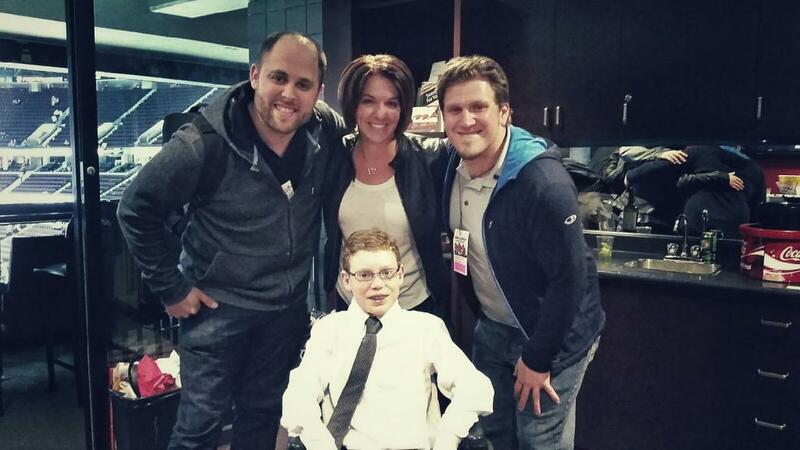 I know it’s possible because of the friendship I’ve forged with my good buddy, Jonathan Pitre.